Discharge some past due taxes? Help you manage special types of debt? Help get your student loan debt under control? Income taxes that are more than three years past due may be dischargeable in a Chapter 7 or Chapter 13 bankruptcy? A vast majority of Chapter 7 bankruptcy cases are approved without the debtors ever having to appear before a bankruptcy judge? Once a bankruptcy case is filed, pending lawsuits against the debtor or his/her property are automatically stayed (stopped)? You can apply for credit immediately after the court grants your bankruptcy discharge? The hardest part of considering bankruptcy is making the first phone call. Once people speak to an attorney, they usually feel better about their financial situations immediately. Our law firm maintains a very active consumer bankruptcy practice. Each of our Kansas City bankruptcy attorneys represents consumers in both Chapter 7 bankruptcy and Chapter 13 bankruptcy. All our attorneys are licensed to practice law in Missouri and Kansas. 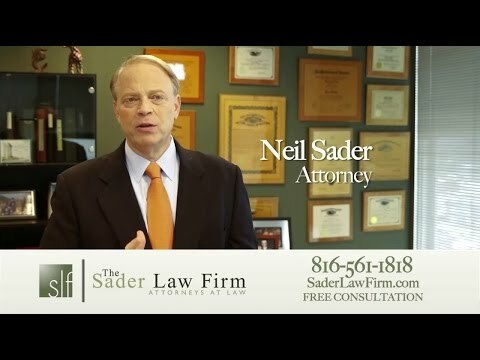 Additionally, principal attorney Neil Sader is certified by the American Board of Certification in Consumer Bankruptcy Law. This certification is awarded only to those attorneys who meet the organization’s rigorous standards to become specialists in this legal area. At The Sader Law Firm, we recognize the benefit a properly filed bankruptcy can have on an individual and family. We offer very reasonable rates and payment plans. We encourage you to call for a free phone consultation. During this 10-15 minute call, we can determine if bankruptcy will work for you and tell you how much your filing will cost. At any one time, our law firm generally has more than 200 active consumer cases. Despite that significant volume, our clients deal directly with their attorneys throughout the bankruptcy process. Each qualified bankruptcy lawyer at our firm is flexible and is willing to schedule appointments after hours and over the weekend to meet client needs. This may include the filing of emergency bankruptcies to prevent foreclosures, release garnishments or to counsel potential clients who may be suffering significant stress related to debt problems. The most difficult time for anyone considering bankruptcy is the period leading up to realizing the need to make that first call to an attorney. Once you make that first call and you start to understand the process, then you will start to feel better. The next worry most have is wondering how they will be able to pay for the bankruptcy or how much a bankruptcy lawyer will cost. At The Sader Law Firm, we allow our clients all the time they need to pay our fees. Once you make the decision to file, we will likely recommend that you no longer pay those debts that will be discharged. This allows clients the ability to gather the funds needed to file. Even if it takes a number of weeks, this allows most people the time to save the money necessary. To save time and the number of trips you make to our office, we will forward a set of forms to you asking, in plain English, for the information necessary to prepare your bankruptcy pleadings. If you fill it out before coming in for your first visit with the attorney, then he or she can better advise you about the effect your bankruptcy can have once filed. Filling out the forms is really the last piece of work you will have to do. The remainder of the work is then up to your attorney! Once your attorney receives all the required information, the attorney prepares the bankruptcy petition and schedules. Those are the legal documents the attorney actually files with the court. You must review those items with your attorney before signing them. Once that is complete and your fees are paid, your case is ready to be filed. Most clients find it hard to believe that once their case is filed, they generally do not see the judge even once. In a vast majority of cases, the debtors attend the required meeting of creditors (presided over by a court appointed trustee) with their attorney – and that is their only court hearing or appearance! In Chapter 7 cases, generally 60 to 90 days after the meeting, the court grants the bankruptcy discharge and the case is over. Most people cannot believe how easy it is. They generally kick themselves when it is over for not doing it sooner! What Bankruptcy Chapter Should I File? There are two main types of consumer bankruptcies available for individuals to file. The main difference between the two types is that a Chapter 7 bankruptcy discharges your legal obligation to pay most unsecured debts. Conversely, a Chapter 13 allows those with secured debts to repay past due debts over time. This prevents creditors from repossessing secured property on which you are making payments. Regardless of the type of bankruptcy you want, there are many requirements, obligations and rules which you need to follow. These almost always require hiring an experienced attorney that handles bankruptcy cases to ensure that you receive the anticipated relief. At The Sader Law Firm, our job is to work with you to gather the information needed, prepare all of the required paperwork, file all court-related documents in your case and appear as your legal representative throughout the process. If you are facing overwhelming debt or foreclosure proceedings, let our foreclosure attorneys help. Please call our Kansas City bankruptcy lawyers now and start the road to recovery.